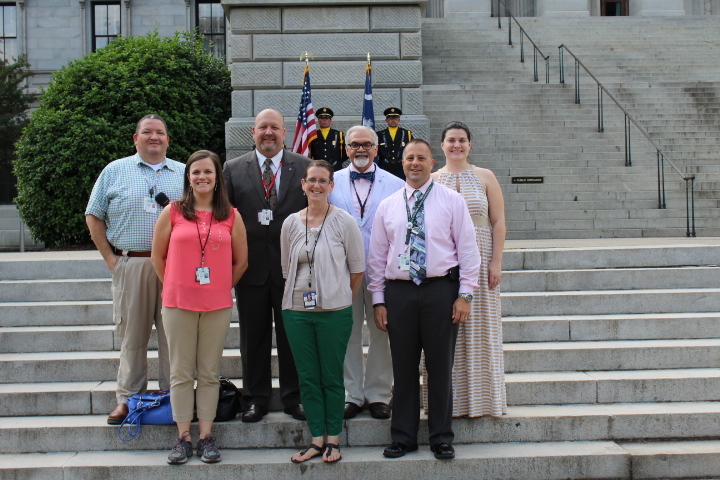 Helping S.C. Stay EMS “Strong!” Celebrating our First Responders | Live Healthy S.C.
Members of our EMS and Trauma team joined officials at the state capitol on May 19, 2015 in recognition of National EMS Week. May 20, 2015 marks National Emergency Medical Service for Children (EMSC) Day. Celebrated each year in conjunction with National Emergency Medical Service (EMS) Week, today is an opportunity to recognize our dedicated EMS practitioners and raise awareness about the importance of specialized care for children in the prehospital and acute care settings. In South Carolina and across the nation, EMS workers play a critical role in the protection and health of our residents and visitors. Often the first line of defense, EMS workers perform life-saving services each and every day. In support of EMS Week 2015’s theme, EMS Strong, I wanted to take a moment to share some of the things that our team is doing to help South Carolina stay EMS Strong. Increase access to cardiac monitors and training for EMS providers throughout the state. Through a $1 Million grant from the Duke Endowment Foundation, we recently provided 20 EMS agencies across the state with 38 twelve lead cardiac monitors. Improve response times in pediatric emergencies. Earlier this year we provided 12 ambulance agencies from across the state with pediatric response bags and training essential to quickly responding to critically injured infants and children — helping eliminate possible dosing errors and ensuring our paramedics our prepared to treat our state’s youngest patients. In addition we trained and certified, free of charge, 25 EMS providers in Pediatric Education for Prehospital Professionals (PEPP) so that they can provide further education and certification to our state’s first responders. An additional class is being held, also free of charge, June 8th-9th to train and certify 25 more instructors in PEPP. A big thanks to our EMS and Trauma team and our EMS practitioners for your continued work and efforts in protecting the health and safety of all South Carolinians. This entry was posted in Emergency Preparedness, Technology, Uncategorized and tagged Emergency Medical Service, Emergency Medical Service for Children, EMS Strong, National Emergency Medical Service (EMS) Week, National Emergency Medical Service for Children (EMSC) Day on May 20, 2015 by SC DHEC.